Discover the magic of the Cyprus mountains with a stay in one of these hotels in Troodos. It never ceases to amaze me how many visitors to Cyprus spend their entire holiday at the coastal resorts and don't bother to head inland to the mountains. 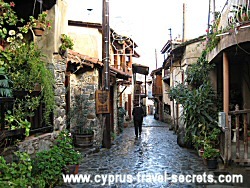 They completely miss the secret side of Cyprus where simple traditions, breathtaking scenery and nature are some of the main attractions and life in many mountain villages has not changed for hundreds of years. If you want to experience the "real" Cyprus, discover a myriad of nature trails or just relax far from the madding crowds on the coast, why not choose one of my suggested hotels in Troodos? 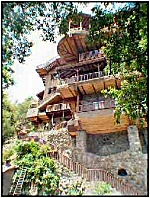 While Platres is the biggest "resort" in the Troodos Mountains with a good choice of accommodation, there are many other beautiful places to stay including traditional agrotourism properties in pretty villages, many of which have been completely renovated to offer modern facilities while retaining the distinctive character of a rustic old-fashioned stone property. I'll start with Platres which is a great base for those who want to be close to Mount Olympus and the ski slopes! Platres exudes an alpine charm with its ski-chalet style architecture, more reminiscent of the Alps than a Mediterranean island. 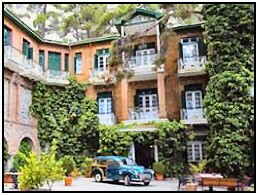 One of the best value hotels in Platres is the Pendeli Hotel. This family run 3 star hotel is situated in the middle of Platres and has a heated pool (May to November), a gym, a sauna plus a spa offering massages and reflexology. Rooms are larger than average so great for kids in tow and some rooms have panoramic views over the valley if you book early. Tip: Save time - Quick search all hotels in Platres for availability. Another good choice is the New Helvetia hotel. This is a real old colonial-style hotel, also with 3 stars, but it's more simple and rustic than the Pendeli above. This Troodos hotel is popular with hikers and mountain bikers. It's a bit "older" in feel than other hotels in Troodos and it may not look like it's been renovated in 20 years, but that's part of the charm of rustic hotels in Platres! Another favourite with walking groups is the Edelweiss Hotel run by a colourful character called George. We've stayed there several times and, while rooms are pretty basic, it's great value for money and you always get a warm welcome. It's also within staggering distance of the nearest bar/taverna after a hard day hiking or biking on the hills! Or how about staying in the more expensive Forest Park Hotel, where the famous brandy sour was invented? If you want stay near the highest point in Cyprus, take a look at the newly renovated Troodos Hotel in Troodos square, 6km up the hill from Platres. It's a hundred metres away from the delightful Atalante nature trail, a 12km circular walk underneath Mount Olympus. An ideal spot for those who want to ski in winter then relax in front of a cosy fire. We've only had a coffee there, but we saw the rooms and they were really comfortable. 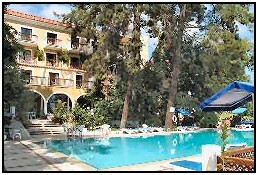 For a true getaway from it all holiday, why not stay in one of Cyprus's many agrotourism hotels? Agrotourism properties offer Holidays in the Cyprus countryside guided by nature and tradition where you can experience a home from home atmosphere and relax in a beautifully restored, traditional environment, surrounded by peace and tranquillity. One little gem I recently found is the Ambelikos hotel, situated on the eastern slopes of the Troodos mountains in a delightful little village called Potamitissa. The hotel consists of a cluster of beautifully renovated stone village houses, listed buildings from the 1800s that were restored in 2008. Here you can EXPERIENCE the old feel of traditional Cyprus, sample local wines and traditionally prepared cuisine or relax in modern conveniences like the health spa's jacuzzi or sauna. Special offers are available at many times of the year. 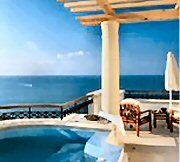 Find the best prices for the Ambelikos Agrotourism hotel here. The larger village of Kakopetria, north of Troodos square on the road back to Nicosia, is another of my favourite places in the Troodos mountains and there are some great hotels in Troodos in this beautiful village to choose from. The Linos Inn is an agrotourism hotel with 22 rooms, all restored from village houses where the linos were places used for pressing grapes. Quirky, with loads of character, the rooms have antique furniture, underfloor heating and a fabulous restaurant called the Meostrato tavern which is always popular. Hotel rooms in Kakopetria are a little more expensive than Platres, but the village is full of character and you can spend many hours wandering through the old quarter. If the Linos Inn is full or you want to be truly pampered, try the more expensive Mill Hotel. Originally built by a monk, the Mill was renovated in 1999 and boasts 13 luxurious rooms. A highlight is lunch/dinner on the scenic terrace overlooking the river, highly popular with locals from from all over the island as a lunch spot. The Mill hotel is closed every year from the 20th November to the 20th December. Tip: For a cheaper option in Kakopetria, try the great value rustic Agroutourism property, the Maritsa Lodge or the Makris Hotel Kakopetria. Enjoy your stay in one of these hotels in Troodos whether it's in a traditional Agrotourism property or a larger hotel in one of the bigger villages.